Many people are intrigued when I say that I am able to cut my course and talk preparation time by roughly 70% using mind maps. The first instinct is to write slides, but that is wrong. Slides are linear. With the ability to make transitions, add pictures and express ideas in full sentences, they are a distraction to the flow of thoughts. Mind maps remove distractions and enable you to focus on getting ideas out of your head. Your thoughts are not linear and mind maps accommodate that. You can see everything at a glance. You can jump from one topic to the next, make changes, rearrange, etc. Planning is the most important thing. A good plan means that more than half of the work is done, since you'll less likely to backtrack. It's much quicker to make changes to a mind map than to a nearly-completed course or presentations. I start with assertions about the audience. Are they developers? What is their skill level? What do they expect to get from this? Then, I write a conclusion to match those expectations. Yes, straight to the conclusion. I can't plot a route without the destination. I fill in the major topics. I sequence them in a way to tell a story that will progressively lead the audience to the conclusion. I read the topics out loud, linking them as I speak. Is the order coherent? Does it sound like an interesting story? I rearrange as needed. Then I fill in with sub-topics. It's okay to write more content than necessary. I can delete some later. Oftentimes, this part requires me to do some research about best practices, because they evolve every day. Once this is done, I quickly read everything out loud, because that's how I spot inconsistencies and missing links. I refine the topics, delete those that add too little value and re-read once more. At this point, the content is solid and I can write the slides, or whatever support material I need. That part is usually much, much shorter than the mind map planning. I probably spend most of that time finding good stock photos. Write your points using as few words as possible. Avoid full sentences. It's supposed to be a reminder, not a novel. It's a map of what's in your mind, not a full brain dump. If you must write down the many ideas that you don't want to forget, make sure that they're in their own branch so that you can collapse that branch. This way, you have the ideas for later, but keep your mind map lean. Mind maps are a powerful tool that will help you do things faster and increase quality. Try to use mind maps for everything: blog posts, functional requirements, vacation planning, etc. 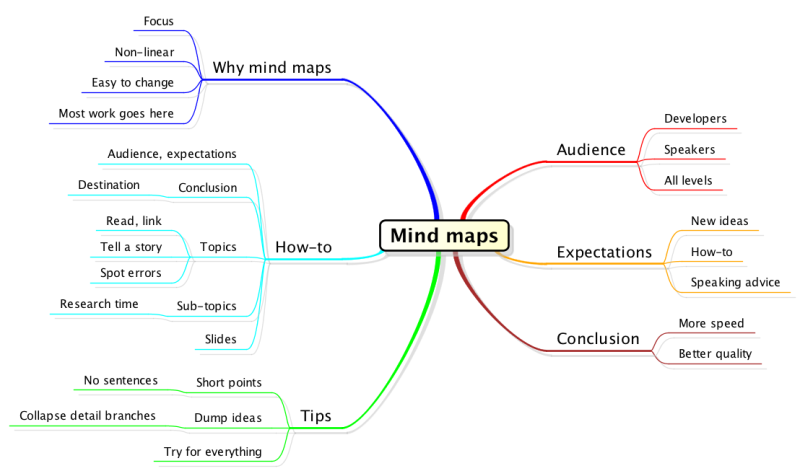 I actually used a mind map to write this post about mind maps. Nicolas September 2nd, 2015 What software do you use or recommand to create mind map?